I heard that my friend is gonna cut some tracks, and they said they want to re-fret their guitars first. Well I know that a re-fret is replacing the frets with new one. What will change if we re-fret? Are there any other alternatives to a re-fret? We re-fret guitars because you can get fret wear from playing. The most common type is when the upper frets of the guitar, usually around 17-20, will wear down because of playing and once the frets are worn down then the strings will begin to rattle more and the guitar will sound less clear. There are materials that frets could be made of that would wear down more slowly or not at all, but those materials are harder, which means the frets would be much more difficult to put on the guitar in the first place, more difficult to make level and even, and the tone would be different. If you play a steel string guitar enough, the steel strings eventually wear down the frets to a point where the intonation is out of balance because the frets lose their crown (which provides a precise point of contact for the string when fretting). And certain frets will wear more than others which makes it impossible to maintain a low action across all frets without fret buzz. The other common thing that happens is that certain frets under certain strings will get divots in them that will mess with your tone and alter the pitch of the fretted notes and cause buzzing. By far the most common metal used for fret wire is nickel. It is used because it is softer and easier to shape and easier to crown and otherwise work with. The problem comes in to play when you constantly grind steel strings (a harder metal) against the softer nickel frets. 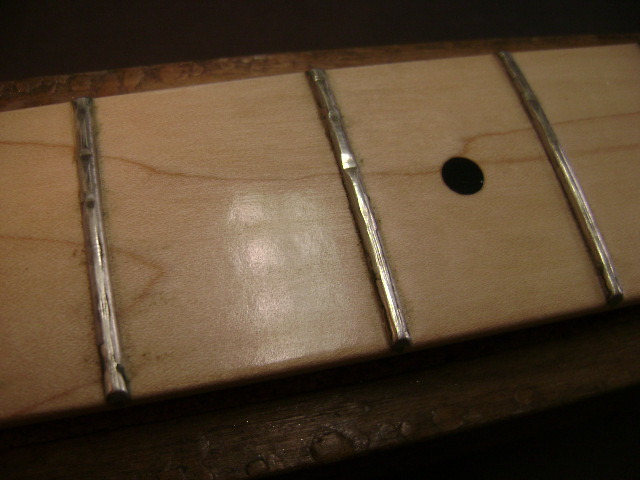 You can re-fret with harder steel fret wire, but even steel frets will eventually show some wear (just not as quickly). Most of the fret wear will be under the plain steel strings. The wound strings are not as harsh on the frets because they are fatter and wound with a softer metal. The frets that experience the worst damage vary according to how you play the guitar. A rhythm guitarist who plays mostly open chords will tend to wear out the frets closer to the headstock first while a lead guitarist who plays up the neck will wear out the higher frets first. Bending will tend to wear flat areas on the frets due to the constant back and forth friction. Minor fret wear and even shallow divots can be taken out with what is known as a fret dress. During a fret dress, the guitar technician will remove all the strings and protect the fretboard with masking tape and use a fret file to file the frets down to the least common denominator. He/she will then level all of the frets - and use a straight edge tool to be sure all the frets are the correct height relative to one another. Finally, he/she will use a crowning file to round the top of each fret such that the crown (high point) is in the exact center of each fret and there is a narrow more exacting point of contact for the strings (vs.a flat surface). You may be able to get by with several fret dressings before you have to re-fret. Another alternative to a total re-fret is a partial re-fret. A partial refret won't save you as much money as you think because it will include leveling and crowning the saved frets, but can still be half the cost of a total re-fret if you only need to replace between 4 - 8 frets (the ones worn too much to dress). A partial re-fret will be more satisfactory if the same gauge and type fret wire can be found to match the existing frets. One of the reasons I play many different guitars is because I know if I played the same one all the time, I would be paying for expensive fret dresses and re-frets more often than desired. For this reason, I have multiple practice guitars and my main stage guitars only get played during live shows. By spreading the fret wear over several different guitars I get more mileage from all of them. But next time I re-fret any of my guitars, I am planning to pay extra (material and labor) to get case hardened steel frets installed so hopefully they will last a long long long time. Not the answer you're looking for? Browse other questions tagged guitar maintenance or ask your own question. Switching my strings from 10's to 9's - am I in for more fret buzz? What physical effects cause ageing/worn guitar strings to change their tone? Why do I wear out the frets on my guitar faster than most other folks? Do I need a lighter touch? Does leaving the excess string uncut, affect the guitar's tone? Fret leveling, where to begin?